tell Eclipse where the MXUnit test runner is located. I presumed it would be a similarly easy process with PHP. Hmmm. No. Well maybe it is if one knows what one is doing, but I don't fall into that demographic, I'm very much in the position of using Google to find instructions, and then follow the instructions often not knowing why I am doing whatever it is the instructions are telling me to do. Fortunately I am never the first person to take this approach, and any problem I have has been solved by someone else. I have to say that a lot of the docs I have found for doing PHP stuff have been written from the perspective of writing notes for someone who already knows what the steps actually are, rather that from the perspective of someone not having a clue. This has been especially the case with the process I am about to document here. Unlike my previous article on starting from scratch and ending with "Hello World" written in PHP, I have already undertaken the process I am gonna document here, indeed I have done it two times trying to work out why some things happen the way they do. However I'm not happy with the end results so I am going to start again, and document my latest attempt. One good thing about "blowing it away and starting from scratch" with PHP is that one can just delete the PHP directory and replace it with a fresh copy from my unzipped download. There's no "installation" per se, beyond the file copy. For expedience I take a copy my php.ini first as it's got a coupla custom settings in it. Contrast this with being faced with doing a similar thing in CF: needing to deinstall and reinstall. What a tedious, long-winded process. OK, starting from scratch, I hadn't even decided that PHPUnit was the way to go here. I was aware it existed, but suspected that along with most solutions to PHP questions, there was more than one way to skin a cat. So I googled "PHP unit test framework" to see what was suggested. There was also a list of PHP unit-testing frameworks on Wikipedia, which mentioned those same three first in the list, and they were three of only four which had links back to a website. And a coupla questions on StackOverflow, one asking "which unit-test framework for PHP: simpletest, phpunit or? ", and one "Best way to implement unit testing in PHP". Both of those seemed to err towards PHPUnit, whilst speaking favourably about SimpleTest too. But I decided to go with my own initial instinct - backed up by the general consensus StackOverflow seemed to have, and decided to go for PHPUnit. All of those mean as much to me as the other, so I just started at the top. Given using PEAR was the option listed first, I presumed this was the preferred approach. So... WTH is this PEAR thing? As per the link above, PEAR is a command line installer for installing PHP apps. I had a flick through the documentation, and landed on the install instructions. 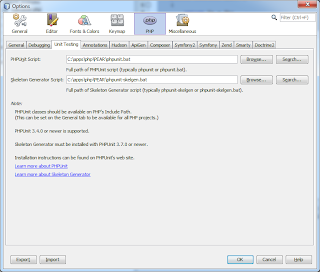 After you have downloaded and installed PHP, you have to manually execute the batch file located in e.g. c:\php\go-pear.bat. OK, that's nice. Well it would be if I had a go-pear.bat file in my PHP dir. I did some googling around and found out it's missing from the 5.4 zip, so I need to install it differently. I cannot remember what I was googling to find this out, nor the page that told me this. Anyway, further down the instructions page it advises how to update PEAR, and I figured perhaps this would also allow me to install it (later confirmed as being correct by my googling). This is after accepting the first prompt, "Are you installing a system-wide PEAR...", to which I accepted the default. Now here's my problem. I have to decide what to do with all these directory options. I could accept the defaults, and the first time I did, but then it goes and installs PEAR directly in my PHP dir, which doesn't seem right to me. It does not seem right to me to install one app inside the directory of another app. It doesn't even install in a sub-directory "pear", it just slaps all its files amongst the rest of the PHP files. Messy. My file structure is such that I have a C:\apps\php directory, within which are two different flavours of PHP itself: the thread-safe one that Apache needs to use, and the non-thread-safe one that IIS needs to use. So I figure that given PEAR is PHP-related, installing it to C:\apps\php\PEAR seems like a reasonable idea. So I'll set all the directories accordingly. using that installer UI, I've been having a lot of problems getting the directories set the way I want... if I set them in the wrong order, it seems to break the installer. I wanted to change the first path (to C:\apps\php\PEAR), but as soon as I did, the script stopped working in that I could no longer change any of the other settings, instead getting an error with some VBS script not being locatable. The only other thing I wanted to change was the location of the pear.ini file (option 11) so I did that first, changing it to C:\apps\php\PEAR\pear.ini. Then I changed the first option, and proceeded. This seems to work. A whole bunch of stuff scrolls up the screen, too fast to react to, but it seems to be just warning about stuff, but otherwise working. that's all innocuous enough, so I run it. When I changed the install path earlier on, the install script got the path slightly wrong, adding two slashes at the end there. No matter what I tried whilst specifying the path would prevent this, so I guess it's a bug in the installer. I fix that path, and wonder about the registry stuff too. Sure enough it's messed those ones up to, so I fix that, and re-insert the registry fragment. This is probably overly pedantic of me, but it's nice to have these things right. (I omitted the path to the config file given it's adjacent to php.exe, so assumed it would find it. It did). Which is what I'm told to expect. Not very exciting though, is it? WARNING: "pear/PHPUnit" is deprecated in favor of "phpunit/PHPUnit"
Done. And checking in the PEAR directory for evidence of PHPUnit, I see C:\apps\php\PEAR\pear\PHPUnit in there, with a bunch of files. I presume this is what I am expecting. Nothing I tried from here worked. Then again, I still didn't really know what I was doing, and the docs go to great lengths to describe how to write tests, but I could not see anything anywhere explaining how to run the bloody things. IE: there should be something runnable in the PEAR dir... however there was nothing executable in there. I began to wonder if that "no available releases for package "pear.phpunit.de/PHPUnit install failed" issue I thought I had worked around before hadn't actually worked. The command line is lovely, but I'd rather be able to run them from either the IDE itself, or from within a browser. Most of my colleagues run MXUnit tests from within Eclipse, but I like running a browser-based version, for some reason. Anyway. first things first... getting it running in NetBeans. More googling, this time for "phpunit netbeans". The first link takes me to some good instructions from Netbeans themselves. Firstly I need to install PHPUnit's Skeleton Generator. Sounds cool. Probably nothing to do with dem bones walkin' around though. (note that the install for PHPUnit looks much like that - although an awful lot more onscreen feedback - when it runs correctly. So look out for that when installing it). 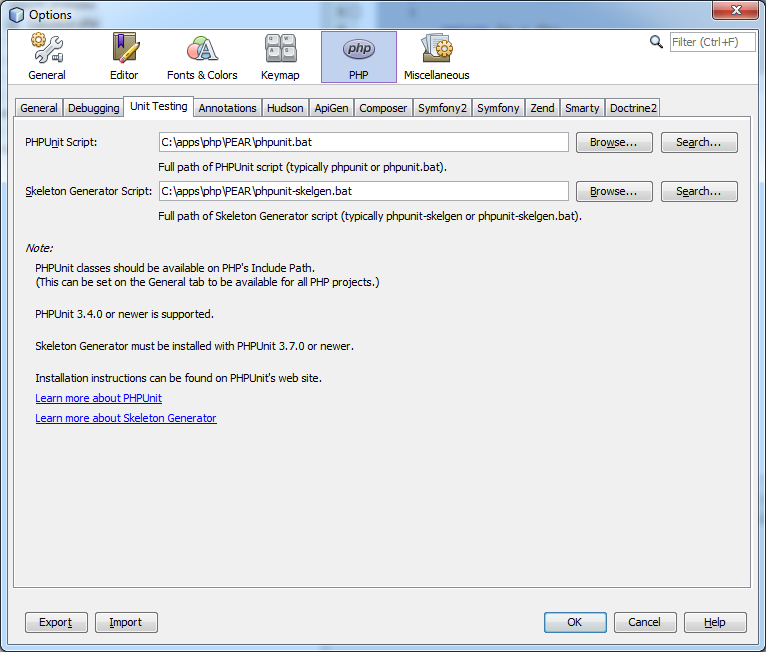 PHPUnit Skeleton Generator 1.2.0 by Sebastian Bergmann. 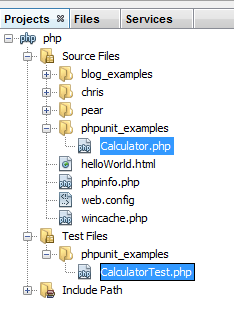 Wrote skeleton for "CalculatorTest" to "C:\webroots\php\phpunit_examples\CalculatorTest.php". * Generated by PHPUnit_SkeletonGenerator 1.2.0 on 2013-05-06 at 15:50:34. That is pretty excellent. I like that. But this is all still command-line. How do I get it to work in Netbeans? And then the tests run A-OK. I guess they ran yesterday because I created the tests in the same directory as the files being tested, which I'd not normally do (and didn't do today). I have to say though, I would have expected the "created your tests automatically" facility would be savvy enough to work out that the test files need to know where the files they're testing are! Not to worry. It could equally be some config I've messed up along the way. I have some leads, but I'm a bit sick of all this now... I've been sitting here for the best part of five hours typing this in and googling about, and I'm out. I'll write a follow-up article on how to get it working in the browser too. I'm pretty pleased to have it working at all though... and both via command-line and IDE is definitely useful!